Since the recent YoY peak was Q3 of last year, the Fed is right on time with its pause. 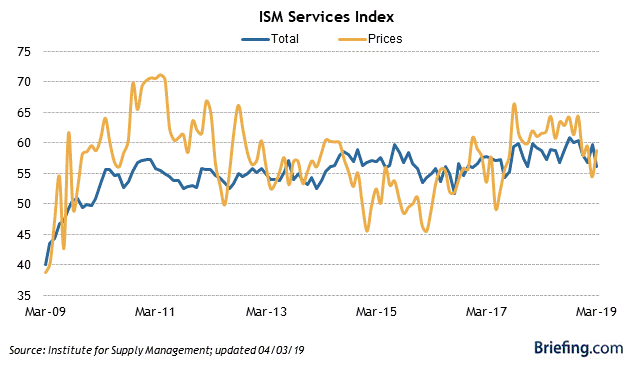 If data continues to weaken, so long as inflation – lately up only 1.5% YoY – remains subdued, the Fed need not worry about prices overheating. With gas prices still $0.01 less than they were a year ago, a spike in inflation in the next few months looks very unlikely, which gives the Fed plenty of space to cut, and avoid a recession. BLS report is in and don’t be fooled. The employment to population ratio fell from 60.7% to 60.6%. OK unemployment rate did not rise but that is because the labor force participation rate fell. Time to cut interest rates! They will wait another month. I always look at PR. NILF is up the 3rd month in a row. CLF dropped the 3rd month in a row. Unemployed numbers are down from January too. Everyone going to NILF. Wouldn’t this be a good time to RAISE rates? 25 basis points won’t crater the economy and would give the Fed more breathing room. 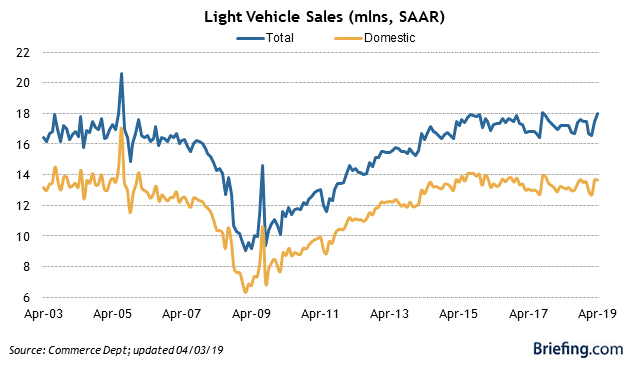 Auto Sales weren’t good in March at all. Totally profit sucking and savings sucking sales by companies that don’t know when to stop. Really dumb business idiots run these care companies now and that includes Asian ones. I smell a new wave of bankruptcies coming in auto because they don’t want to admit over saturation has come. Corporate and personal credit debt has stopped growing which is why the Dec-Feb period consumption flirted with 2% nominal growth, which is the recession trend line. We can’t slow anymore. If growth stays in the 2-3% range, the current level of capacity can be held. If it slows down to 1-1.5%, its done. You can also see it in inventory ex-energy rising as well. Jobless claims were a “shutdown” recovery mirage as much as the January/February numbers spiked. The private sector has been bouncing around 220-230 level since November adjusted. The economy has flattened out. Yet, you forget that. Cutting rates………….won’t help. WIll probably hurt. Nothing matters with the debt cycle.